Japan’s government has approved a fresh 10.3 trillion yen ($116 billion) stimulus package in an attempt to spur a revival in its economy. The package will include infrastructure spending, as well as incentives for businesses to boost investment. Tokyo estimates that the stimulus will boost Japan’s economy by 2% and create 600,000 jobs. Japan’s economy has been hurt by a dip in exports amid slowing global demand and subdued domestic consumption. The world’s third-largest economy is currently in a recession, having contracted for two quarters in a row. 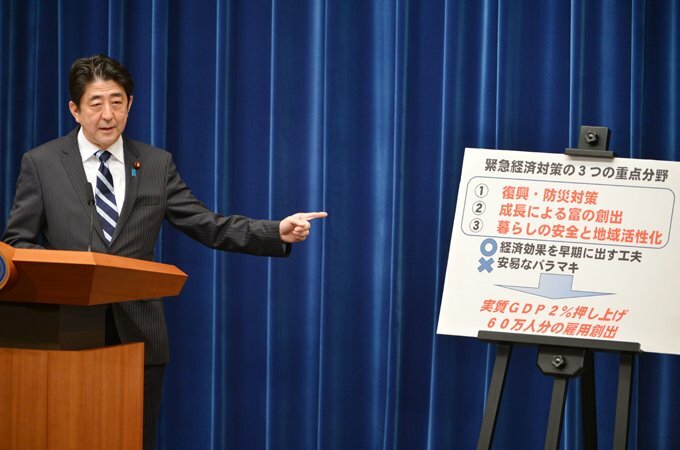 “Unfortunately, the previous administration failed to work out how to boost growth and expand the economic pie,” Prime Minister Shinzo Abe said. Included in the spending package are plans to rebuild areas devastated by the earthquake and tsunami of 2011, support for regional economies, and more investment in education and social security. Shinzo Abe, who took office in December, has promised to take aggressive measures to help put the economy back on a growth track. Among those has been a pledge to take measures to weaken the yen. A weaker Japanese currency bodes well for the country’s exporters as it makes their goods less expensive to foreign buyers and also helps boost their profits when they repatriate their foreign earnings back home. The yen has weakened nearly 12% against the US dollar since November last year on hopes of such moves. It was trading close to 88.97 yen against the US dollar in Asian trade on Friday. The government said that it would continue to keep a watch on the currency’s movements and “respond as appropriate”. Japanese shares rose on the news of the stimulus with the Nikkei 225 index gaining 1.4%. The Japanese government also hopes the latest stimulus spending will help to tackle deflation. Japan has been fighting deflation, or falling prices, for many years. It has been a big hurdle in policymakers’ attempts to boost domestic demand because consumers tend to put off purchases in the hope of a better deal in the future. However, some analysts said the stimulus was only a short-term solution to Japan’s economic issues. They said that while such an big amount of money being injected into the economy was likely to help spur growth, further steps were needed to sustain it in the long run including measures to help exporters and reforms aimed at boosting domestic consumption. “So far what we have seen is measures to kick-start the economy,” said Martin Schulz of Fujitsu Research Institute. Japan’s exports have been hurt by a slowdown in demand from key markets such as the US, eurozone and China. While sales to the US and eurozone have been hit by economic issues in those markets, those to China have been affected by a territorial dispute between the two countries. China is Japan’s biggest trading partner and is also among the fastest growing consumer markets. Martin Schulz said Japan needed to improve its relations with China to help its exporters’ sales in the country, not least because demand from the US and eurozone is likely to remain subdued in the near term. On the domestic front, Japan needs to ease regulations in key sectors such as construction, healthcare, retail and agriculture to make them more attractive for investors, Martin Schulz added.